Ning’s announcement also says that it will be giving network creators more details in the next two weeks. While the email talks about Free versus Premium paid networks, Ning actually has a variety of different premium upgrades. Currently, Ning’s premium options include support (which has a $10/month and $100/month options for different service levels); Custom domains ($5 a month); Extra storage and bandwidth ($10 a month); Ad removal ($25 a month) and the ability to hide any trace that you’re running on Ning ($25 a month). As a result of today’s news I suspect we’ll see quite a few active networks jump to whatever the cheapest premium option is; I don’t expect Ning to make it especially easy to port their data to a different service. There will also certainly be a backlash from Ning’s vocal community of Network Creators, many of whom have invested quite of bit of time building out their niche networks. 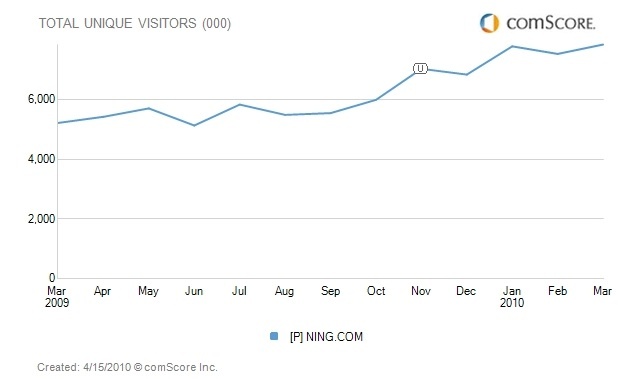 While the massive layoffs are obviously a big hit to the company, it isn’t all bad news for Ning: the service is still seeing its traffic grow according to comScore (see graph below). But traffic growth is no longer good enough for the company — it needs to start generating some serious revenue, and advertising clearly isn’t cutting it. Ning has raised around $120 million, getting valuations of a half-billion dollars in April 2008 and a reported $750 million last summer.